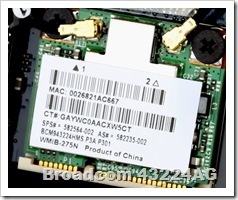 DESCRIPTION: This package contains drivers for the supported Broadcom Wireless LAN Adapters installed in the supported notebook/laptop models running a supported operating system. This driver supports 802.11i/WPA2 for a/b/g and certain b/g WLAN cards. For other cards, it provides Wi-Fi protected access (WPA) support. This driver also supports Cisco Compatible Extensions Program V4.0 features (software supplicant required) and provides support for "125 High Speed Mode" for notebooks with Broadcom 802.11g and 802.11a/b/g cards that support "125M High Speed Mode."